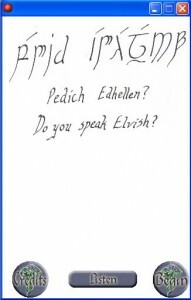 Do You Speak Elvish?” Is a small ap for the PC to teach the user Quenya. This includes lessons 1-10. I am making these lessons to teach my own children Elvish. I am making the ap available here so you can learn also. These lessons use an immersion method (comparable to the Suzuki method of teaching music) which is excellent for teaching children and adults alike as the student begins speaking the language from the very first day. It is a very fun and exciting way to learn a language. Sound is included for pronunciation with each “card” in the lesson. Some Sindarin words are substituted when a Quenya word is not available. Updated October 12, 2011 with new phrases! Get it now! Name your own price! Lesson 1 is primarily derived from several internet sources, and includes common phrases and greetings so you can start speaking conversational Elvish immediately! Lesson 2 adds even more common phrases drawn from various internet resources. Lesson 4 teaches the words for God (this is the proper noun for The One God), Son of God, Mother of God, Bless, Blessed, the phrase “God bless you” and all 5 lines of Elrond’s Blessing from the book. Lesson 5 is the Quenya translation of The Lord’s Prayer, from the notes of J.R.R. Tolkien himself. 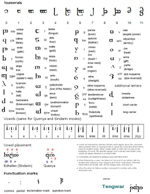 I disagree with using Tengwar punctuation in the Roman style alphabet of the Quenya translation, I think it should be consistent with the font/keyboard being used, but that is how J.R.R. Tolkien did it so that is how I did it in this lesson. Lessons 6-10 include the words for language, letter, alphabet, and all 43 characters in the Quenya alphabet, culminating in the phrase for “Lord of the Rings” in Quenya as written by J.R.R. Tolkien himself. I’ve put many many hours into this course already, and will continue to add to it at least through November 2011. Please donate according to your ability. The resolution is 320×480, and should run on any PC. Sound is included for pronunciation practice. I hope to get it onto mobile devices soon but still have to figure out how to get that process working. Meanwhile you can download it and play it on your computer, netbook, or other PC device. CLICK TO HEAR A SAMPLE: A star shines on the hour of our meeting. Q. Is this the Elvish language from Lord of the Rings ? A. Yes, this is Elvish from the Lord of the Rings stories. 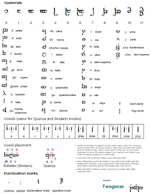 Quenya and Sindarin are two of the many languages invented by author J.R.R. Tolkien for his famous stories. Quenya is old Elvish, Sindarin is 3rd age Elvish, both are spoken in the time of the 3rd age. J.R.R. Tolkien was friends with C.S. Lewis and they both belonged to a writing group called “The Inklings”. Both of these famous authors were Atheists who became Christians, and their Christian faith and ideology is reflected in their stories. Q. Why do the graphics look like they were drawn on plain paper? The script is hand drawn with a real calligraphy pen because it is extremely difficult to write Tengwar (the Elvish script) in a Windows font, due to the positioning of the vowels (the vowels in Quenya go above the consonants), due to variations in consonants (s, r and z all have two forms depending on whether they are followed by a vowel or not), and the way certain letter blends are combined into different characters to make a new letter. There have been people to develop fonts that can be used in Windows, but they come with a huge list of codes that must be learned to use them correctly. By using a calligraphy pen, I am presenting the letters the way they might have been written in Elvish scrolls. I hope you are able to enjoy the lessons, despite the obvious human touch on the cards. Q. The Elvish languages are beautiful. Why aren’t the cards more elaborate? I intentionally do not embellish the cards with decorations so as to focus on learning the words, as decorations can be distracting. In some educational circles it is considered bad form to add any extra decorations to the card when trying to teach a new bit of information. Once you learn to read and write Quenya you can add all manner of elaborate decoration to your calligraphy artwork, but for now the focus is on learning the language. Thank you for understanding. Updated October 12, 2011 to include Lessons 1 through 10! Note: Updates, expansions and corrections will be released immediately as they are available. You will find them here on this page. New lessons will continue to be released at least through November 2011, more if there is sufficient interest to make the endeavor worthwhile. The elvish script is called Tengwar, and the alphabet is a little different than our American alphabet. There are two styles or “modes” for writing in elvish. The old style is called Quenya and based on the old elvish, or High Elf language. The 3rd age style is called Sindarin (Edhelen) and is the language of the Grey Elves. Of course, both Quenya and Sindarin are fantasy languages invented by J.R.R. Tokien, there are no native speakers of elvish, so both languages are somewhat incomplete, but we can derive from them both to accomplish a fairly reasonable means of communication in elvish. There are some words from each language that are not found in the other language, for example “hello” or “greetings” does not exist in Quenya so we use the Sindarin word, surmising that the same word must have been used since ancient elvish times and remains unchanged into the 3rd age. For sanity sake however, we must choose a script in which to write, as we can not comprehend what is written when mixing and matching the Tengwar modes of both Quenya and Sindarin. We have chosen to use the Quenya mode for these lessons. If you would like to learn to write in Tengwar, the best website resource we have found is http://www.omniglot.com/writing/tengwar.htm however they made no effort whatsoever to put the Tengwar into an order that resembles the American alphabet (perhaps it is the order of the alphabet the elves chose? I don’t know) so I spent about 3 hours this morning in photoshop rearranging the letters in an order that is more logical to my American brain so I can spell the words I’m trying to write more easily. I also got them all to fit on a single sheet of letter size paper, so they can be printed and used offline more easily, such as in a class setting. If you would like to benefit from my efforts to make these more user friendly and download these Tengwar sheets, please make a donation according to your ability.